Osmosis is the diffusion of water through a semipermeable membrane according to the concentration gradient of water across the membrane. Whereas diffusion transports material across membranes and within cells, osmosis transports only water across a membrane and the membrane limits the diffusion of solutes in the water. 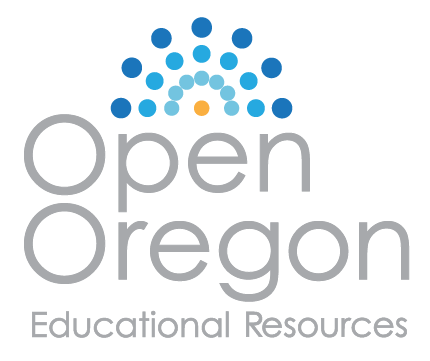 Osmosis is a special case of diffusion. Water, like other substances, moves from an area of higher concentration to one of lower concentration. 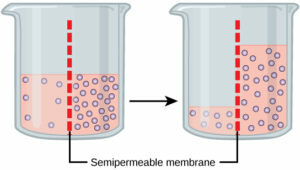 Imagine a beaker with a semipermeable membrane, separating the two sides or halves (Figure 3). On both sides of the membrane, the water level is the same, but there are different concentrations on each side of a dissolved substance, or solute, that cannot cross the membrane. If the volume of the water is the same, but the concentrations of solute are different, then there are also different concentrations of water, the solvent, on either side of the membrane. Figure 3 In osmosis, water always moves from an area of higher concentration (of water) to one of lower concentration (of water). In this system, the solute cannot pass through the selectively permeable membrane. A principle of diffusion is that the molecules move around and will spread evenly throughout the medium if they can. However, only the material capable of getting through the membrane will diffuse through it. In this example, the solute cannot diffuse through the membrane, but the water can. Water has a concentration gradient in this system. Therefore, water will diffuse down its concentration gradient, crossing the membrane to the side where it is less concentrated. This diffusion of water through the membrane—osmosis—will continue until the concentration gradient of water goes to zero. Osmosis proceeds constantly in living systems. Tonicity describes the amount of solute in a solution. The measure of the tonicity of a solution, or the total amount of solutes dissolved in a specific amount of solution, is called its osmolarity. Three terms—hypotonic, isotonic, and hypertonic—are used to relate the osmolarity of a cell to the osmolarity of the extracellular fluid that contains the cells. In a hypotonic solution, such as tap water, the extracellular fluid has a lower concentration of solutes than the fluid inside the cell, and water enters the cell. (In living systems, the point of reference is always the cytoplasm, so the prefix hypo– means that the extracellular fluid has a lower concentration of solutes, or a lower osmolarity, than the cell cytoplasm.) It also means that the extracellular fluid has a higher concentration of water than does the cell. In this situation, water will follow its concentration gradient and enter the cell. This may cause an animal cell to burst, or lyse. In a hypertonic solution (the prefix hyper– refers to the extracellular fluid having a higher concentration of solutes than the cell’s cytoplasm), the fluid contains less water than the cell does, such as seawater. Because the cell has a lower concentration of solutes, the water will leave the cell. In effect, the solute is drawing the water out of the cell. This may cause an animal cell to shrivel, or crenate. In an isotonic solution, the extracellular fluid has the same osmolarity as the cell. If the concentration of solutes of the cell matches that of the extracellular fluid, there will be no net movement of water into or out of the cell. 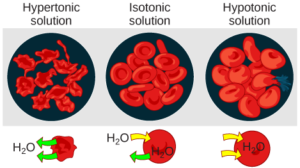 Blood cells in hypertonic, isotonic, and hypotonic solutions take on characteristic appearances (Figure 4). Some organisms, such as plants, fungi, bacteria, and some protists, have cell walls that surround the plasma membrane and prevent cell lysis. The plasma membrane can only expand to the limit of the cell wall, so the cell will not lyse. In fact, the cytoplasm in plants is always slightly hypertonic compared to the cellular environment, and water will always enter a cell if water is available. This influx of water produces turgor pressure, which stiffens the cell walls of the plant (Figure 5). In nonwoody plants, turgor pressure supports the plant. If the plant cells become hypertonic, as occurs in drought or if a plant is not watered adequately, water will leave the cell. Plants lose turgor pressure in this condition and wilt.